PHOENIX (April 9, 2019) – (GLOBENEWSIRE) GlobalTranz Enterprises, Inc., a leading technology-driven third-party logistics (3PL) solutions provider, has been named to Transport Topics’ listing of Top Freight Brokerage Firms for the fourth year in a row, moving up in the 2019 ranking to No. 8 from No. 10 in 2018. One of the most respected publications in the trucking and freight transportation space, Transport Topics annually names the biggest players in the industry to its Top Freight Brokerage List. This recognition speaks to GlobalTranz’s record year-over-year growth and continued leadership in third-party logistics and transportation management systems. The strength of the GlobalTranz go-to-market model creates a diverse revenue pipeline. Organic growth, strategic acquisitions and exceptional performance of transactional and managed transportation continue to contribute to the company’s success. Ongoing investment in proprietary technologies and expanded multi-modal service offerings add value for customers, strengthening GlobalTranz’s market leadership on a global scale. Reported $1.4 billion in revenue in 2018, representing 62 percent growth year-over-year, a net revenue increase of 63 percent, and EBITDA growth of 150 percent. Completed a total of nine acquisitions in the period of January 2017 through April 2019 that further expanded the company’s footprint and capabilities while adding world-class talent. These include Chicago-based Circle 8 Logistics and AFN Logistics and Greensboro-based SynchOne, LLC. Released new technology products including the all-new, market leading GTZcommand™ Transportation Management System (TMS). GlobalTranz is a technology company providing award-winning cloud-based multi-modal Transportation Management System (TMS) products to shippers, carriers, 3PLs and brokers. GlobalTranz is leading the logistics software and services market in innovative technology that optimizes the efficiency of freight movement and matches shipper demand and carrier capacity in real-time. Leveraging its extensive independent agent network, GlobalTranz has emerged as a fast-growing market leader with a customer base of over 1 million product users and 25,000 shippers. 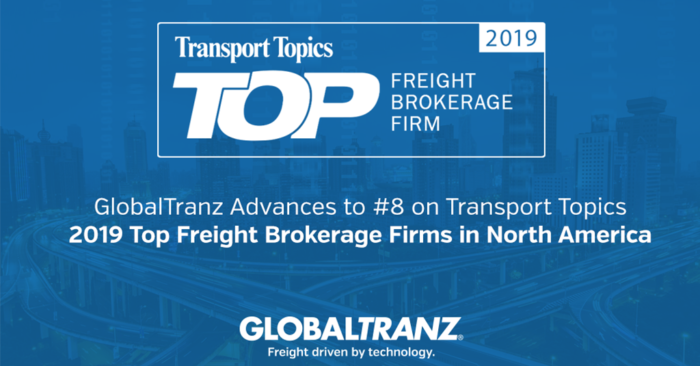 In 2019, Transport Topics named GlobalTranz #8 on their list of Top 10 largest freight brokerage firms in the U.S.